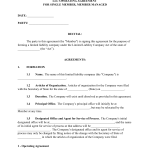 Download free limited liability company (LLC) operating agreements which allow the owners, known as ‘members’, to create a binding contract that states each individual’s: ownership percentage (%), duties, roles, management, registered agent, and any other terms agreed upon by the partners. 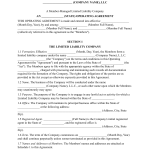 The form is a required with the formation of an LLC in the following States: California, Delaware, Maine, Missouri, and New York. Although the form is highly recommended for ALL formed limited liability companies.